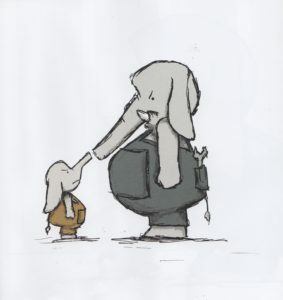 So, to follow up on Eliza’s last post about appealing anthropomorphic characters, have y’all met Little Jumbo? 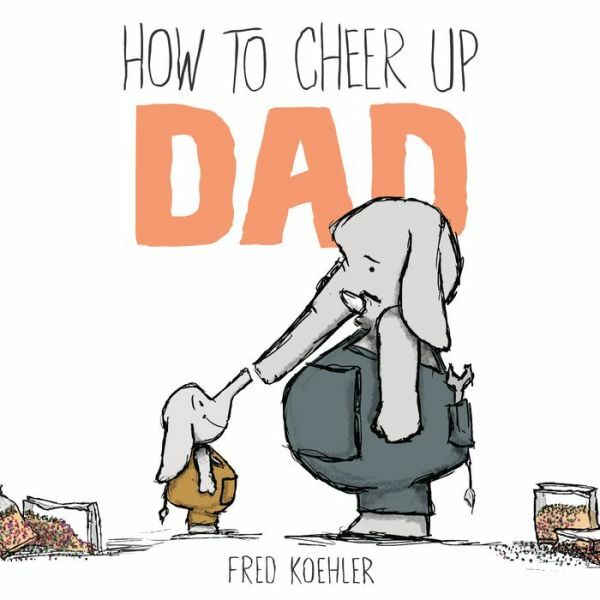 If not, get your hands on a copy of How to Cheer Up Dad by Fred Koehler (Dial, 2014). What’s so appealing about the little guy? For starters, he’s a bit naughty. Personally, I like that in a character. 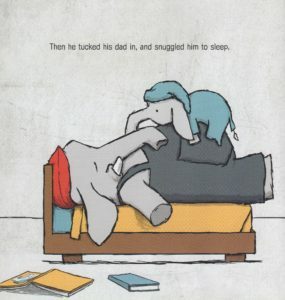 Little Jumbo’s dad was having a bad day. Then Dad unwisely puts raisins in Little Jumbo’s oatmeal. Well, what’s a little elephant to do but shoot those raisins to the ceiling? And, of course, Dad should have known better than to tell Little Jumbo he needed a bath, or try to dress him in those dreaded brown overalls. With all those bad choices, Dad’s mood worsens—leading Little Jumbo to suggest he needs a time-out. Little Jumbo gets one instead. This gives him time to think of ways to cheer up his grump of a dad. 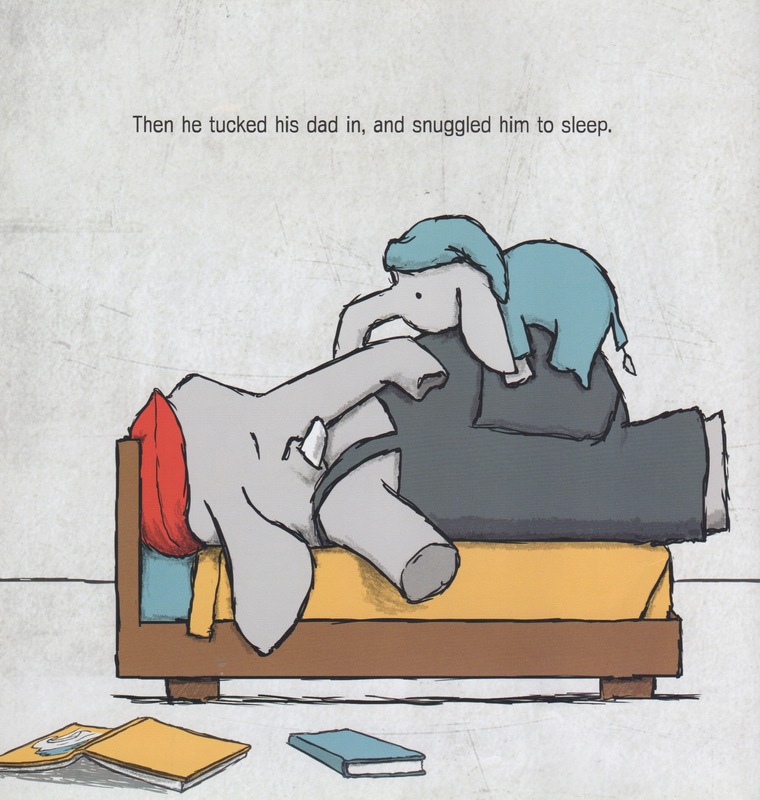 Oddly enough, it turns out that the things that improve Dad’s mood just so happen to be some of Little Jumbo’s favorite activities—like playing catch, sharing an ice cream cone, and snuggling up with a book at bedtime. Well, Fred could have wrapped it up right there with a sweet “Awww” ending, but he went for the “Ha!” instead. 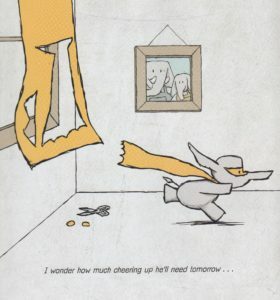 When Dad’s sound asleep, Little Jumbo slips out of bed to take on another creative project involving yellow curtains and a pair of scissors . . .
. . . offering the perfect segue to the next installment, Super Jumbo, which recently arrived in bookstores. Be sure to check that one out too. The winner of the All We Know Giveaway is Darlene Koppel. Thanks so much for all the nice comments! Character, character-driven stories, Fred Koehler, How to Cheer Up Dad, Linda Ashman, Super Jumbo. Bookmark. How To Cheer Up Dad looks terrific. I will have to check both books out. Thank you! It IS terrific! Thanks, Heather. I think you’ll enjoy them both! I am so glad that Mr. Koehler has given us picture books starring a son and his father. I was enjoying the antics of this “child” so much that I forgot he was an elephant. 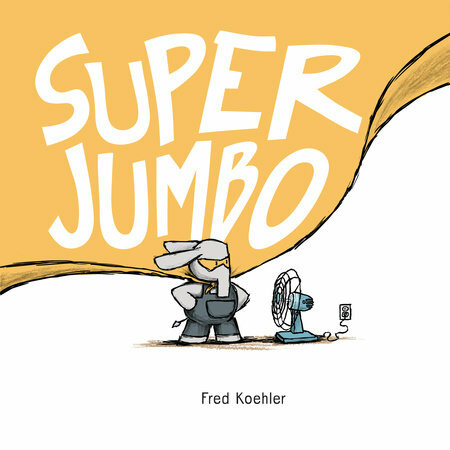 Mr. Koehler has certainly captured the creative innocence of a child’s perspective. The “ha” ending is perfect! I love it! Thanks so much for sharing. I can’t wait to get a copy and share it with the children at school. I will definitely be getting Super Jumbo as well. I agree, Lori. 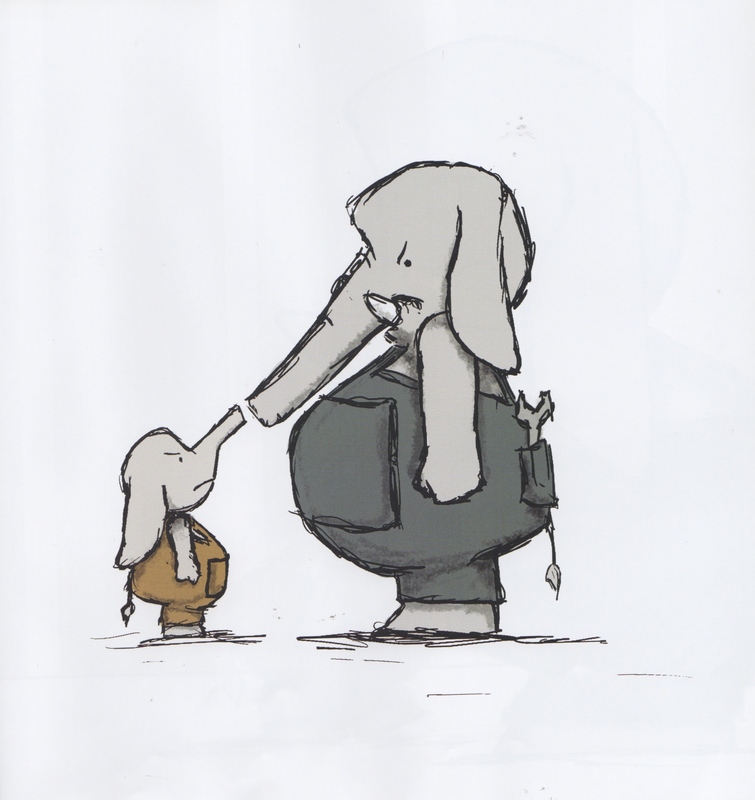 Little Jumbo is so childlike you kind of forget he’s an elephant. Maybe that’s true of the best anthropomorphic characters. Or any characters–they just seem very natural and realistic. I was touched by the picture of son snuggled up to sleep. It just happens to be on dad’s belly. This shows that there are no boundaries. Father letting son into his “space” and son knowing just where he needs to be. I love that scene too, Joy. So much tenderness. Hi Joy! I love that scene as well. At 6 and 8, my kids are now nearly too big to snuggle, but from time to time they forget and crawl right up on my chest. It’s a perfect spot for them. I’m definitely adding both books to my collection! They look super fun! They are! I think you’ll enjoy them, Kris. It’s quite a trick to set up a sequel in the ending to a picture book. I’m impressed with the author’s ingenuity as well as his humor. Yes, and it works really well, even without knowing about the sequel (which I didn’t upon first reading). These look fabulous! What a great cover for Super Jumbo! How did I miss this one!? Thanks for bring Jumbo to my attention. I will have to get both books. I think you’ll enjoy them, Susan! These look fabulous ~ off to check them out. Thank you! Adorable! I can’t wait to read these books! Thanks for sharing them with us. They really are adorable. I think you’ll like them, Angie! What a great idea for a “how to” title, and the cover of Super Jumbo is hilarious. Wonder if the manuscripts were sold as a pair? Will be checking out both of these. Thanks! Good question, Sue. I don’t know! Hi Sue! 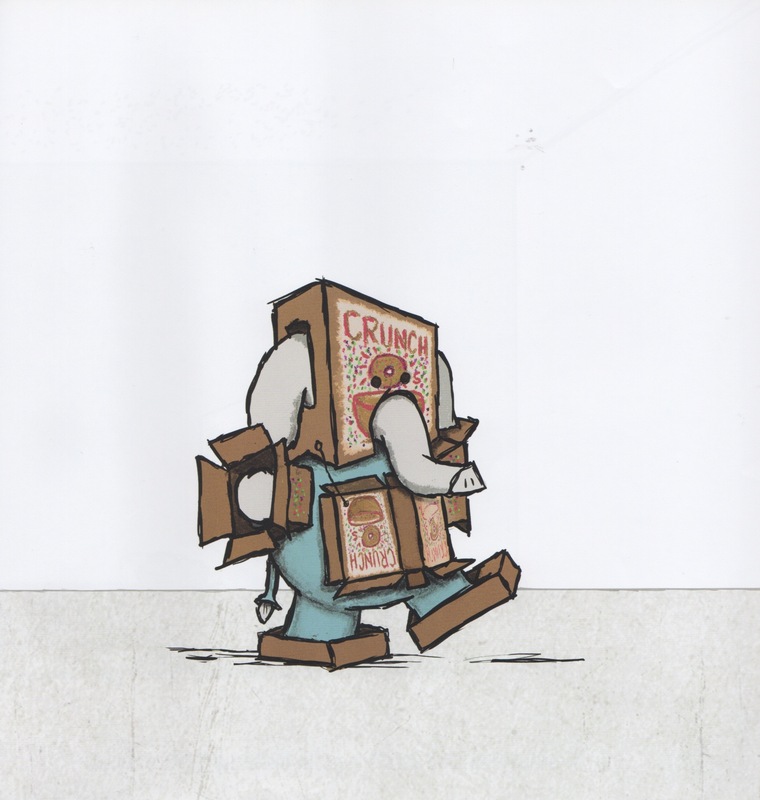 This is Fred, the author / illustrator. HTCUD sold in a two-book deal, but we had no idea what the sequel would be. We must have gone through a dozen different manuscripts before Lily Malcom, the art director, said “Why don’t you just start the next book where the first one left off?” It was a bit of a palm-to-forehead moment, and SUPER JUMBO was born! The book sounds & looks delightful–and I really appreciated those helpful hints at the end! Thanks, Eve. I think you’ll like them! I may be mistaken, but I think I raised Little Jumbo. These look like really fun books. A little bit of naughtiness does spice a book up! I’ve taught a few Little Jumbo’s in my teaching career. Oh, I bet! Fun to have in the classroom, I’m sure–and exhausting too. Little Jumbo’s need a bit of extra attention. And they’re usually quite clever. A good puzzle will keep them busy. (Said the writer who spent a lot of his grade-school years doing puzzles). Me, too, Quinette. They definitely make for fun picture books! I think you’ll enjoy them, Bridget! I love this one. It reminds my of when my kids were little and clueless, or was it me? Thanks, Lotus. Happy to hear that! I LOVED this, Linda! I met Fred at a winter SCBWI conference just after he signed the contract for these two books (and I had just signed for my first book), which was a bonding experience. 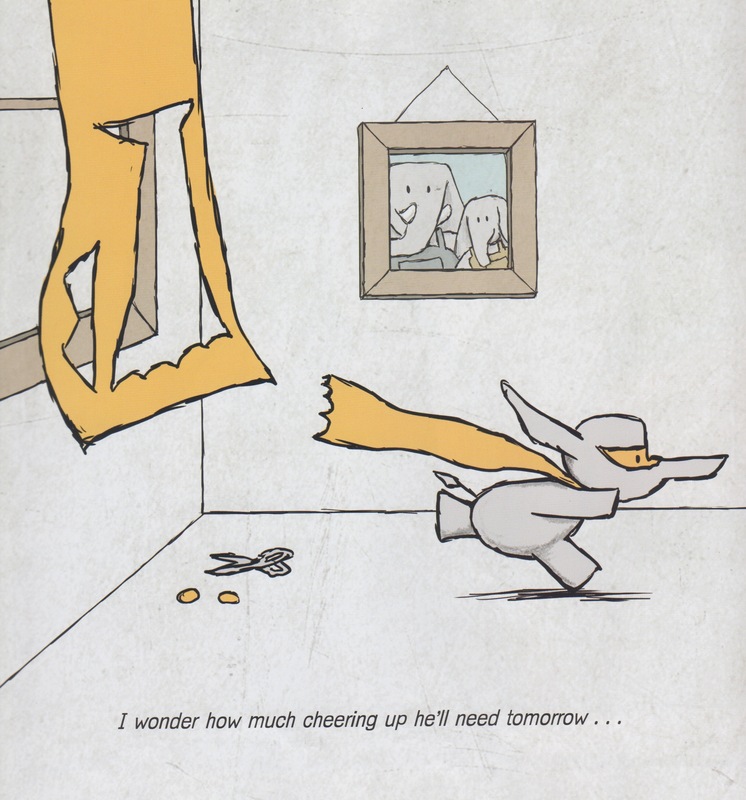 These books are a wonderful example of anthropomorphism done perfectly! Love your list of qualities they require . . .